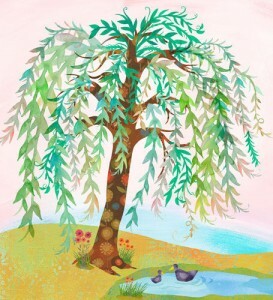 Willow is the Celtic Zodiac Tree for April 15th - May 12th. Willow is tied deeply to this time of year, which marks great growth and emergence. What has been latent and gathered in the depths of winter now begins to really leap forth. For this reason, Willow is deeply associated with Brigid, the maiden element of triple goddess (mother, maiden and crone). Brigid honors her re-emergence as a young virgin, the maiden, from her wintery mother, Cailleach, the crone or divine hag. Yet there is another element of Willow that is important. In the ancient temple of Delphi, Orpheus, the greatest poet of ancient times, is shown leaning on a Willow tree. Orpheus had the ability to speak to everything around him. Some believe that the Willow, which he carried on his journey to the underworld, gave him the gift of poetic speech. Willow, then, is intimately linked to the poetic sensibility—great sensitivity, the ability to listen deeply, and an attunement to the emotions, from the darkness of the underworld to the heights of heavenly vision and glory. The quality of this sensitivity is not passive. Like the rising of light, the green fuse of plants, Willow has vibrancy and energy with great momentum and growth. In the ogham alphabet, carved into rocks to write old Irish between the 4th and 6th century AD, the Willow is Saille which later became the name, Sally, meaning to express emotions intense, or rush out. Again, In Latin, to leap is “salire,” which is tied to the name Willow. Essentially, the Willow’s realm is that of the emotion. It lives in or near water—water representing the feeling and intuition, but in a particular context. The “Willow moon” is about getting in touch and expressing deep emotions used to inspire exuberant growth. As such, the Willow supports bringing deep emotional pain or any hidden emotions to the surface from which you can sally forth. In the Bach flower remedy, people who have become embittered through misfortune and adversity can be healed by taking Willow. The water element also connects to vision and intuition. Willow branches have also been used as divining rods for those seeking water underground. Willow can even aid in helping you remember dreams—you can make a Willow wand and place it under your pillow or bed. Willow also has many medicinal uses. Willow bark contains salicin which can be converted to salicylic acid in the body—a compound that is very similar to aspirin and has been used for over 2000 years. Like aspirin, willow bark has been used to reduce paid, fever and rheumatism. Finally, one of the most extraordinary qualities of Willow is its resilience. When I was restoring a creek bank in New Mexico, we cut off pieces of Willow and stuck them in water through the newly formed creek bed. There, they rooted and help stabilize and heal the land. Change, displacement, being cut off from what nurtures you can be very difficult. Yet Willows can thrive, and start over even if they are cut off from their roots. They show, by example how to work with displacement, how to grow with loss and find new direction. Subscribe to our occasional newsletter of Celtic Culture and special offers. Hi, I got my Lotus earrings today; they are so pretty. I just love your jewelry! I get compliments almost every time I wear your earrings – I have 4 pair now. My sister and I gave each other your earrings for Christmas – we thought that was funny (we both have good taste). I’ve also been enjoying your new newsletter. Thanks for beautiful things. I recently had successful surgeries and received my ring, pendant and earrings the day before I left. I felt so lucky that you processed my order so fast. Thank you so much, and I love everything! Thank you! I just wanted to thank Reflective Images for the lovely pendants I purchased. I received my Dawn pendant with blue moonstone, and Shadow Box pendant a few days ago. I’ve worn each pendant once, and have already received several compliments. Everyone who helped me was a pleasure to deal with, and I really appreciate the extra effort you made to meet my request for blue moonstone. I look forward to purchasing more pieces in the future, and hope to visit your showroom again soon. I just wanted to send you a quick thank you for how wonderfully you handled my repair. I’m thrilled to have my bracelet back, and it looks beautiful. I very much appreciate the extra effort in cleaning it up and in your professionalism in handling the issue. I will most certainly continue shopping at Reflective Imagery, and I will be telling my friends and family about my wonderful experience. I recently ordered a borderless Flores ring with a 2.5 mm blue Zircon set into it – and I absolutely love it! Thanks to whomever forged it…and to Helen for the beautiful design. I will definitely be recommending your company to others. Just to let you know we have received the bracelet, it is great and we’re very happy with it. Thank you for your excellent service! Oh wow, you really did it this time! I had no idea you were working with my husband on the bracelet, necklace, and earrings – they are all fabulous. Your designs are timeless, I will enjoy them for many years, thank you so much for helping Santa surprise me! Have ordered several things and have gotten nice comments on each piece when I wear it. Truly love my portal bracelet – first purchase and the quality is outstanding. I wear it every day. © 2017 Reflective Jewelry | Celtic Jewelry. All Rights Reserved. We are the first Fair Trade Gold Jeweler in the US, and we support the work of Fair Jewelry Action. FJA is an activist, human rights and environmental justice organization within the jewelry sector.